A public plaza, pedestrians and public transit? Yesterday I attended a panel discussion on the idea of a public plaza on the north side of the Art Gallery in the 800 block of Robson Street. The idea has been around for a while. The area was closed to traffic during the Olympics and a couple of temporary closures have happened during the summer months. It seems like a pretty strait forward idea, but the problem is the street closure impacts public transit. The #5 Robson bus goes through the 800 block of Robson Street. For folks in the West End the Robson bus is their main connection to the downtown. Is it possible to build a public plaza on the south side of the Art Gallery and have good public transit to the downtown? 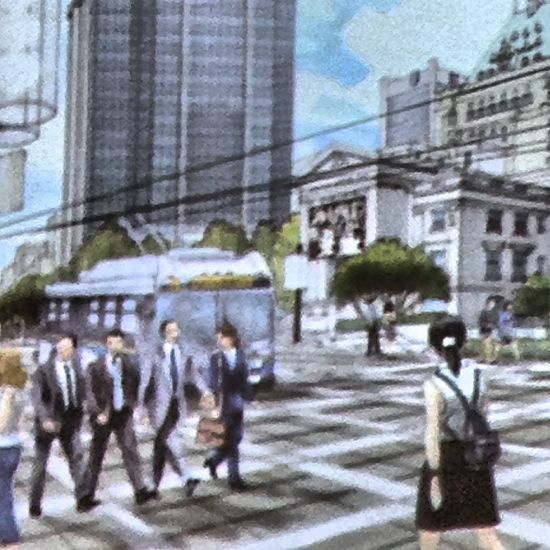 One of the ideas that was presented at the talk was having a public plaza that would have transit run through it. This is a very common idea in many European cities where pedestrian only areas also have streetcars running through them as well. The review is in “phased two” and will be proposing alternate routes and collecting more feedback early in 2014. Phase three will start in the spring of 2014 and recommend routes will be presented and I would think feedback will be gather at this time as well. Tagged with: 2040 Transportation Plan, 800 block robson st, north side of art gallery of vancouver, public transit, Translink. ← Conflicted Space? Robson Square, Viva Vancouver and the #5 Robson Bus-Do you care?